We're so excited to share this holiday-inspired creative shoot! Our friends from So Fresh and So Chic approached us with this concept, and we were more then happy to take on the project! See the full feature, and a few extras, below! "A couple of weeks ago, I kicked off holiday posts on this blog by sharing inspiration for a modern holiday. 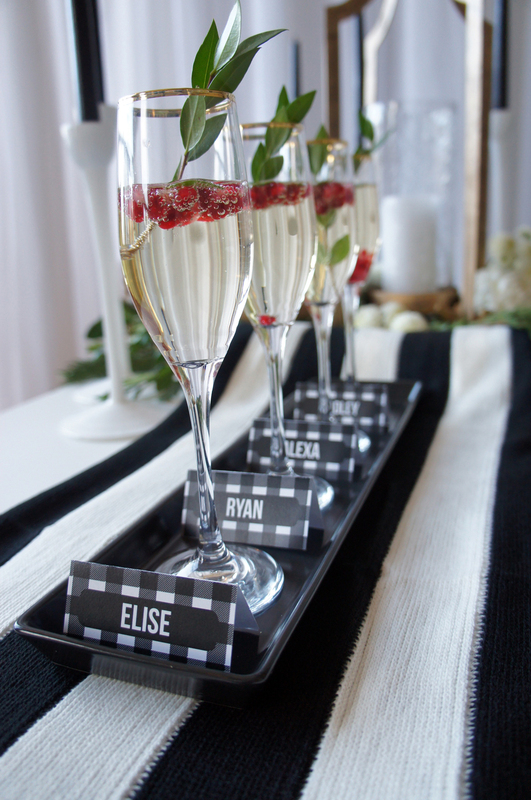 Since I thought of “Lessons from a Stylist” shortly after, I emailed my bestie, Sara Baig from Sara Baig Designs in Toronto, who just happens to be an event stylist and asked her to create a modern holiday table for the blog. The only requirement was that it be black and white. 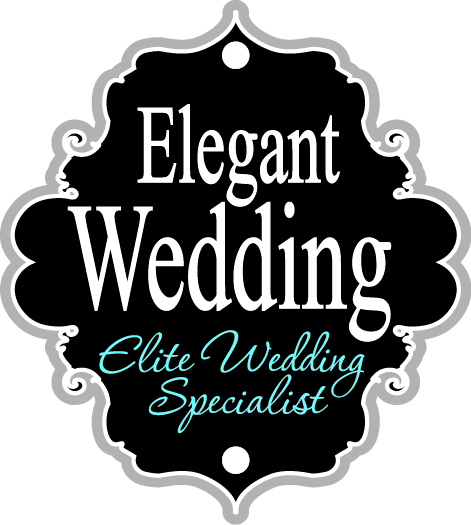 Mainly though I wanted her to design something that you could leverage for any occasion and that you could easily replicate yourself at home. And boy, did she deliver! Besties are the best like that, aren’t they? - Naushin"
If you’re like us at Sara Baig Designs, that is, you love Christmas but dread the tacky ornaments and light-up figurines, then this post is for you! 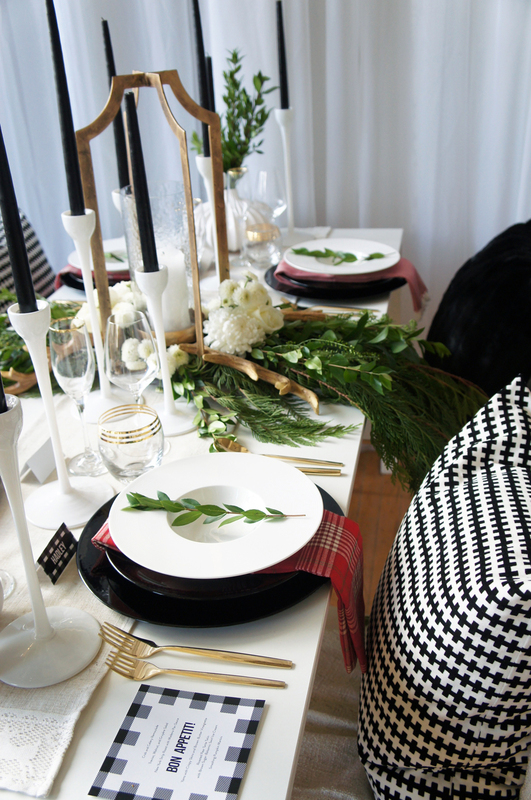 We’re here to shine some light on the art of creating a Modern Black and White Holiday Table, that has just enough spirit and chic elements to keep designers-at-heart satisfied without sacrificing any of the practicalities of hosting a fabulous dinner party. We are so thrilled we were able to collaborate with Naushin on this project, and we have to say her stationery perfectly complimented the design of our tablescape. We can’t wait to share our tips on creating this modern look yourself! Remember to subscribe to her mailing list to receive the editable PDFs for your own holiday table. When deciding on the elements to put together your holiday table, the easiest thing to do is look for items that can be re-used throughout the year. Consider them investments into your everyday life and then fill in the details by bringing in less expensive seasonal items. For our arrangement, we brought in basic staples from Ikea like the black dinner plates, the gorgeous white wide-rimmed bowls, candlesticks and vases. 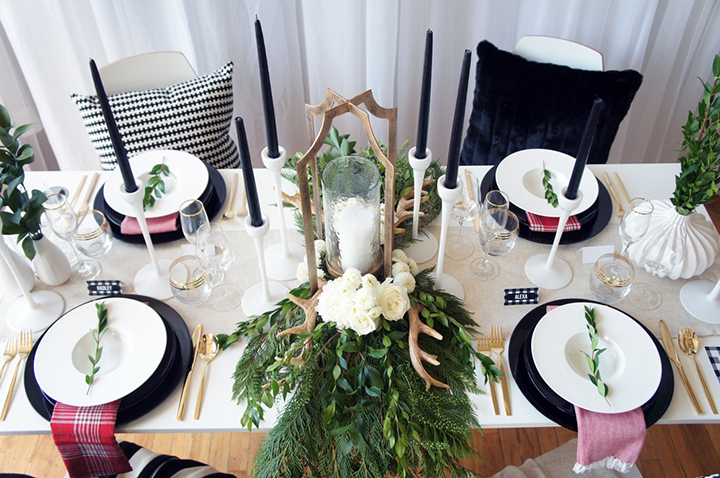 The focal point of this table, and the seasonal detail, are the gold lantern, the antlers and the floral arrangement. We rented the gold flatware but if you’re lucky enough to live near a Target, you can pick up gold flatware at $19.99 per place setting! Of course, if your everyday budget allows it, West Elm also has some beautiful options in metallic flatware. Now that we have the modern vibe down with all of our staples, it’s time to introduce some traditional Christmas elements. We fell in love with the chevron and tartan napkins, and decided to use both to add a pop of red to accompany all of the greenery on the table. After all, nothing says Christmas more than red and green together, right? We also created a contemporary seasonal floral arrangement using white flowers, cedar and coffee leaf branches accented with those gorgeous antlers. To finish off the look and carry the modern monochrome look throughout the space, we introduced bold black and white cushions, throws, ribbons and wrapping paper. And there you go! A simple Scandinavian-inspired colour scheme and a few modern elements combine to form a drop-dead gorgeous, chic and festive, black and white holiday table. We hope we’ve inspired you!